Welcome to Know Direction’s PaizoCon 2015 coverage. Know Direction – We con when you can’t. Come join members of the Paizo staff to discuss how Pathfinder and Golarion can be more inclusive and fun for people of all shapes, genders, sexual identities, ages, ethnicities, and more—both in the books, and around your gaming table. Everyone is welcome! Warning – These are live and unedited recordings of the PaizoCon 2015 seminars. If the seminar contains audience participation, it may be difficult to understand some of the audio. Also be warned – these seminars may contain cheeky language. 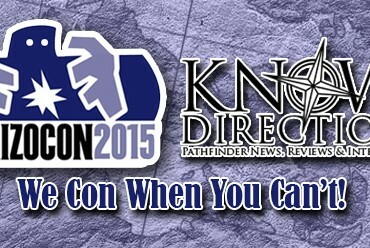 Know Direction’s PaizoCon 2015 coverage is made possible by the KD Con team. Thanks go out to Rich Flynn, Sarah Bull, Darran Caldemeyer, and Alexander Augunas. Don’t know where else to post this, so I’ll leave it here. To the folks who asked questions about visually impaired players, braille, dice, and maps. The questioner mentioned that his player had found braille dice for everything other than the d20. My very first DM was blind. He had braille dice for the d4-d12. But for the d20, he bought a some giant d20s. Like, the size of his fist. Even though they weren’t braille, with a little practice he could simply feel the numbers incised in the die. He needed help to pick out the 6 from the 9, but he was \able to ‘read’ all the other numbers. Those huge dice usually cost about $5 each today. But a GM willing to put in a bit of extra time and effort can make maps at least semi-legible to the visually impaired. You wouldn’t want to ruin your flip maps, but if you printed out a map, you could go over the grid lines with either a hot glue gun or puff paint, and even add in at least basic features like walls or bushes by making the lines thicker or thinner. I owe my learning to play AD&D from that DM, since he ‘made’ me read the entire Player’s Handbook aloud to him, so that after about 5 years of running games, he finally used his braille writer to transcribe the PHB into braille as I read it to him. Here are a couple of pictures of terrain I made for a PFS scenario (Perils of the Pirate Pact). While I didn’t make this with the visually impaired in mind, someone could easily run their fingertips over the pieces and figure out what’s going on.